Free Printable Garage Sale Sign. Free Printable Garage Sale Sign that you can use to inform people passing by your neighborhood about your Garage Sale. This is a great free temporary sign to get more people to your Garage Sale and increase your total sales of new, used and unwanted furniture, clothes, toys, baby items. 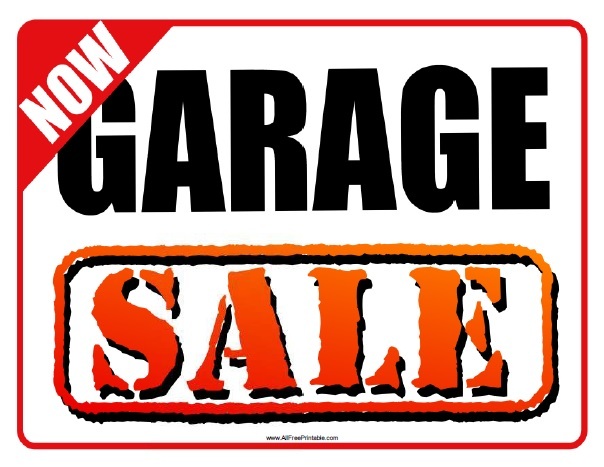 Print this Garage Sale Sign free using your laser or inkjet printer, and put every corner near to your home. You can print the Garage Sale sign in 3 options, Garage sale sign and with left or right arrows. Click the link to download or print the Garage Sale Sign free in PDF format. I hope you have great garage sale.